Smart-Review did a hands-on test in a very demanding environment. We took a Rebel T3i with the stock 18-55mm lens to the consumer electronics show (CES 2012) and (CES 2013) this January in Las Vegas. Our goal was to get both video and pictures of the latest electronic gear. We purchased the T3i specifically for this show, as we knew that we wanted both high quality pictures and video in one camera as lugging around both a camcorder and SLR would be cumbersome, especially squeezing around the 150,000 people who attended the show. Canon makes it easy to do both, when you set the dial for the movie setting, you can also snap pictures without changing the dial. We used both the autofocus of the T3i, and also used manual focus for really demanding situations (such as items behind glass, and some items where we wanted closeups). When in video mode, you can use the autofocus to intially focus on the subject, but then you must manually focus if your subject moves, or you move the camera to other subjects. This is true of most video modes on DSLRs. The professional videographer manually focuses at all times. We found after a while, manual focus got easier as we got used to the lens, and actually preferred it to autofocus at times. For pictures, the autofocus is quite good and fast, although once in a while in low light it can at times hunt for the focus point. When the focus is locked in, the T3i focus point (on the Live View screen) turns from white to green and emits a tone to let you know its locked in. 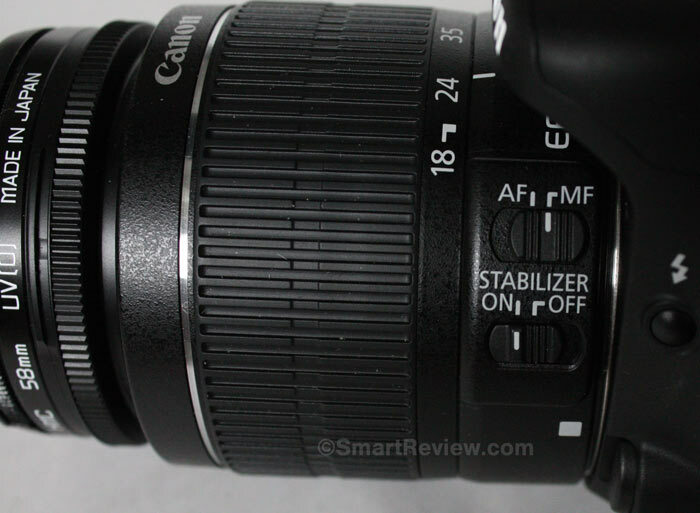 Smart-Reviews’s evaluation of the T3i is that it did an excellent job at both still pictures and video, which is what we had hoped for. All of our coverage of CES 2012-2013 was done with this camera. We recommend a class 10 card with 30mb/second speed if you are going to use the video mode. The camera was quick on startup, and the stock lens that came with the camera did a very good job. 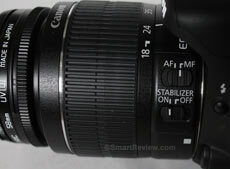 You can of course buy more expensive lenses that will give you even better picture quality, however we wanted to test it with the kit lens, because most people buy this camera with the kit 18-55mm lens. 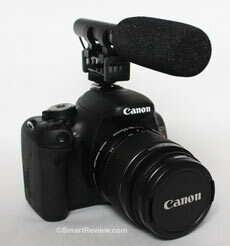 While filming video, we were especially impressed by the sound of the built-in microphone. It was very clear and picked up sound well, much better than we expected. Although we had external microphones, we decided to use the built-in microphone for testing purposes and to keep our camera light and easy to use in this demanding environment of the trade show. The only thing we might bring next year would be a video light, as there are times when lighting was poor and a small light would have helped, but even in these conditions the camera did well. The camera took about 900 pictures and video without a hiccup. We went through about 1 1/2 batteries a day, so make sure to get a spare battery, especially if using the Live View and video. Speaking of Live View, we found it easy to focus the camera while in Live View because of the high resolution LCD, and rarely used the viewfinder. One reason was the odd angle that we had to position the camera to get shots. The articulating screen came in handy when holding the camera above our head to get shots above the crowd, or down low where you would have to get on the floor to get the shot. The video quality of the Rebel T3i will be similar to the Canon 60d and 7d as they all share the same APS-C imaging sensor. 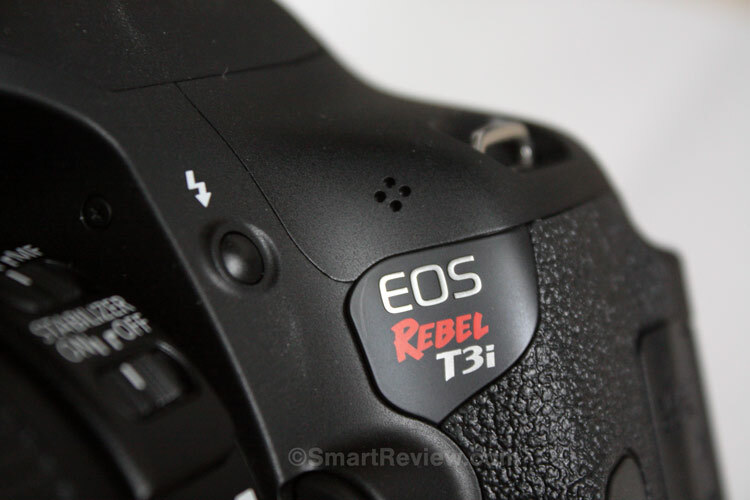 Conclusion: The Rebel T3i is the perfect camera to get for both pictures and video at a reasonable price. The kit lens and built-in microphone gave a solid performance, while allowing for upgrades to external microphones and more expensive lenses. Keep in mind that manual focusing while taking movies will be required should your subject move. Rebel T3i Sample Video: Here is a video taken by Smart-Review with the Canon Rebel T3i, with the stock 18-55mm lens, built-in microphone, and manually focused. We used a class 10 SDHC card rated at 30mb/sec. You can increase this youtube video to 720p for better quality (it defaults at 360p). We shot this video at 1080p, so it looks even better than what you see here. The sound quality is exactly as we shot it.